Upon your first attunement to Reiki, setting the intention to connect with this healing energy is all that is needed. At the same time, there are specific methods that will develop a rejuvenated, and increasingly stronger connection, with consistent practice. The first two methods of rejuvenating the Reiki connection have been outlined in “Reiki Clearing to Rejuvenate the Reiki Connection”, and “Rejuvenating Reiki Connection with Cleansing”. While it is not necessary to complete these first two steps before embarking on the third step of connecting to Reiki, they will help you achieve the best results. Regardless of your choice in completing the first two steps of clearing and cleansing, you will want to complete the Reiki Connection methods on a daily basis to achieve significant results. Then, if you do chose to pursue the clearing and cleansing practices as well, you will want to complete them on a weekly or monthly basis, depending on your preference. Before practicing the Reiki Connection methods, it is important to consider how Reiki is an energy. Just like any other energy, Reiki flows more strongly through a clear and expansive conduit. The best example would be to consider electrical conduits. Electricity flows everywhere, but some conduits can only handle 120 volts of energy, while others are created to handle increased energy, such as 600 volts or much more. How much Reiki energy your energetic system can conduit, or channel, will depend on what practices you pursue in order to connect with the energy. If you took the time to do the Reiki Clearing and Reiki Cleansing practices, then you should have a clear path for the energy to flow through without inhibition. Then, the Reiki Connection methods will allow you to further expand your capacity. The ultimate goal to rejuvenate and strengthen your connection to Reiki is to become a unified energetic system that is clear of all blocks. This is important because your mind, body, spirit, and emotions all have a direct impact on your capacity to flow healing energies. Reiki self-healing treatments and sitting in Gassho meditation are two of the most widely recognized practices for increasing your capacity for Reiki. Both of these methods will help to heal and create unity within your energetic system for Reiki to flow freely through. 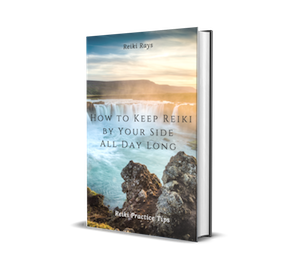 Living by the Reiki principles is also crucial, as these principles are designed to increase your connection to Reiki through right living. Self-healing, Gassho meditation, and living by the Reiki principles will help a great deal in connecting with Reiki. At the same time, they do not provide the necessary component of unifying the material body with the rest of your energetic system. For this, a daily Yoga practice is a must for serious Reiki practitioners. Further, yoga connects your personal energetic system to the cosmic energetic system. This connection will significantly boost your capacity for Reiki energy. Upon completing yoga for the day, sitting in Seishin Toitsu meditation is very powerful to complete your connection to Reiki. This type of meditation will complete the unification process and flow energy with increased capacities. Sit in Lotus, Half-Lotus, or simply upright in a chair. Place your hands in Gassho, touching your third eye, lips, or heart. Visualize breathing through your hands, with pure white energy traveling into your hands, your arms, your shoulders, into your heart, and then into your belly during every in breath. Imagine this energy flowing out of your belly, through your heart, shoulders, arms, and out of your hands on every out breath. Repeat for at least three minutes, and up to a half hour. When you have completed Seishin Toitsu meditation, raise your arms high into the air and set the intention to connect with Reiki. At this point, you should feel a complete connection to Reiki that will continue to strengthen upon practice.